Union Safety - Official Website of NW BT Union Health and Safety Coordinators Committee: Single Use Plastic Banned By EU – In Britain Too? On Wednesday 27th March 2019, the European Parliament approved a new law banning single-use plastic items such as plates, cutlery, straws and cotton buds sticks. 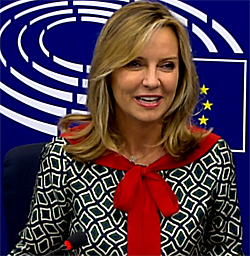 The group within the European Parliament, Europe of Freedom and Direct Democracy (EFDD), whose president is Nigel Farage; abstained from the vote in Committee and again in the Parliamentary session which voted on the proposals to ban single use plastics! Whether or not this ill apply to the UK depends on the outcome of the current Brexit shambles in the UK Parliament, and whether or not the Government will wish to ensure this directive becomes part of UK law. Given some of the outlandish, and to be frank, stupid stance on banning single-use plastics because of it being a EU decision and the ERG group in the Tory party; it is more likely that the needs of business will be put before the needs of the Planet's ecosystem! That said many businesses in the UK see the need for alternatives than single-use plastics. Those who care about the planet and the future of their children, will see this vote as representing a major step forward in the global fight to reduce plastic pollution which is causing immense damage to the wildlife in our oceans and is now threatening the whole ecological system. “This legislation will reduce the environmental damage bill by €22 billion - the estimated cost of plastic pollution in Europe until 2030. Due to its slow decomposition, plastic accumulates in seas, oceans and on beaches in the EU and worldwide. 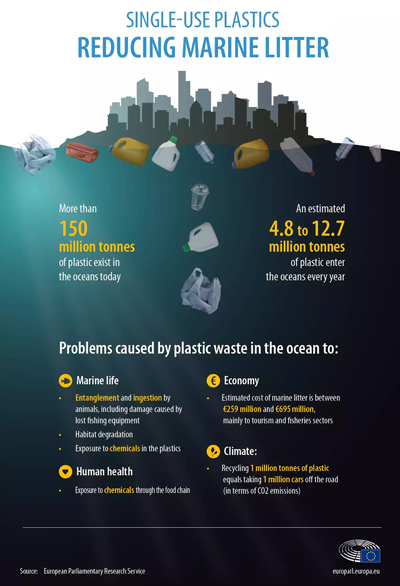 Plastic residues are found in marine species – such as sea turtles, seals, whales and birds, but also in fish and shellfish, and therefore in the human food chain. The Commission is proposing a comprehensive set of measures to address this problem. The Single Use Plastics Directive is an integral part of the wider approach announced in the Plastics Strategy and an important element of the Circular Economy Action Plan. It builds on the successful reduction in consumption of single use plastic carrier bags brought about by EU legislation in 2014, and on the newly revised EU waste legislation, which includes targets for the recycling of plastics. You can download the briefing to the EU Parliament issued in 2018 which provides the evidence and recommendations for action on single-use plastic waste and fishing gear in the Unionsafety E-Library using search word 'plastic'.